Home » Uncategorized » It’s Corn On The Cob Time!!! It’s Corn On The Cob Time!!! 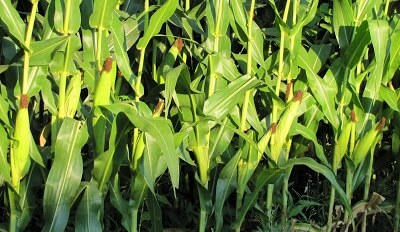 In the cornfields surrounding my house the corn is getting ready. Look how full the ears are. This one is almost busting out of its husk. 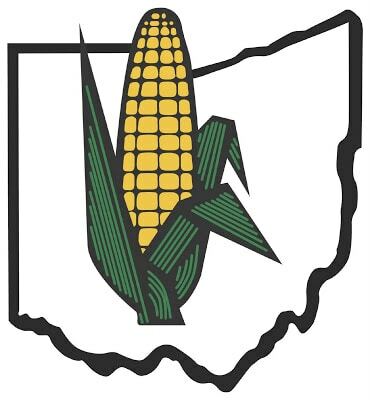 I hear it’s been a good year for corn in the Midwest and we Ohioans like our corn. 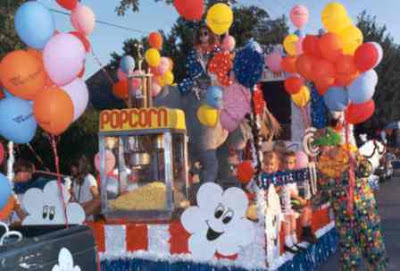 Millersport, Ohio has a corn festival. Marion, Ohio has a popcorn festival. 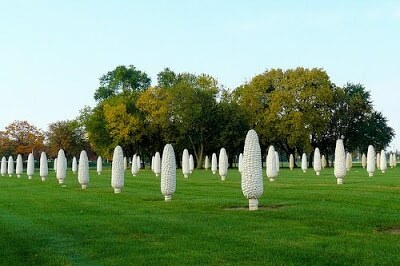 Dublin, Ohio has a cornfield made of concrete. Yeah, it’s one of those artsy things. 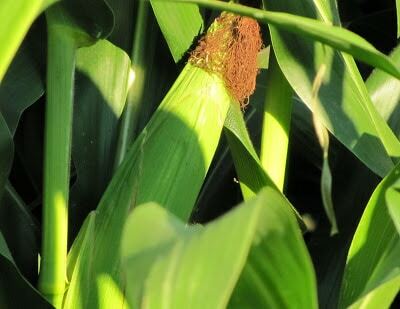 109 ears of corn the size of people “growing” in a former cornfield. There’s something ironic about taking a cornfield and making it into a cornfield which then makes it not able to be a cornfield anymore. 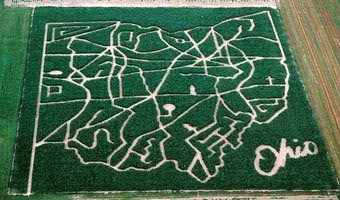 We love corn so much we turn it into corn mazes in the fall. 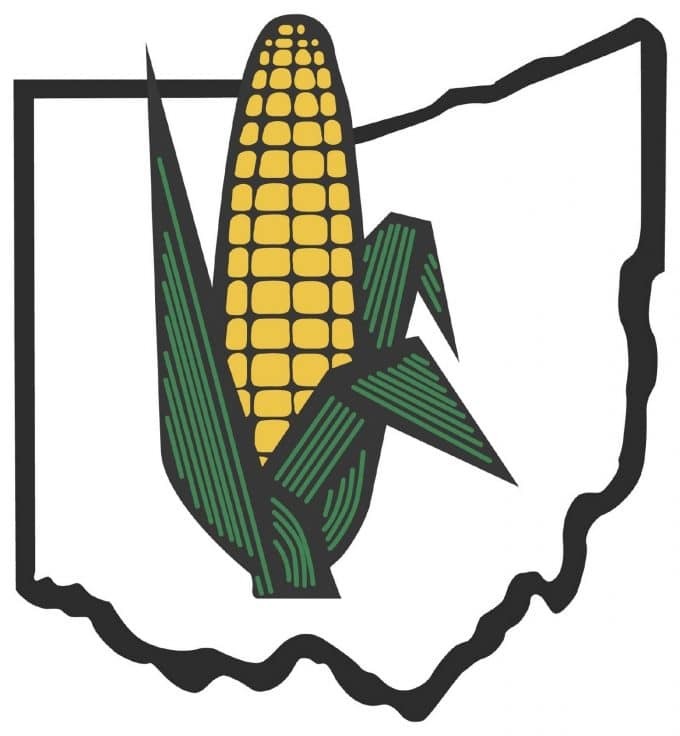 Get it – a corn maze made from maize.This would be an Ohio corn maze, but they come in all different designs. For those that haven’t experienced one before, you walk through a field of really tall corn that you can’t see over and try to find your way out. If you get lost or stuck in a dead end path someone will eventually rescue you. 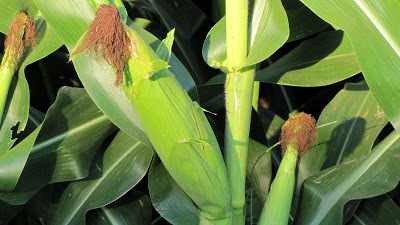 Guess what we had for dinner last night?The corn in “our” cornfields is feed corn, so this was bought from a local farmer who sells it out of the back of his pickup truck parked in front of his barn. He also sells some of his wife’s pickles that she cans. It’s an unmanned stand since he’s probably off farming or something, so he has a little coffee can where you deposit your money – it’s a honor system thing. I tried to take a picture of his “stand” yesterday to show you because it’s just so cute, but he was stocking it when I got there so I felt weird about whipping out my camera. I would have to explain the whole blog thing to him and all and I didn’t want him to think I was a nut case. Because if he thinks I am a nut case it would jeopardize my ability to get more of the best corn I have ever eaten in my entire life. I’ll try to get a shot next time I go. 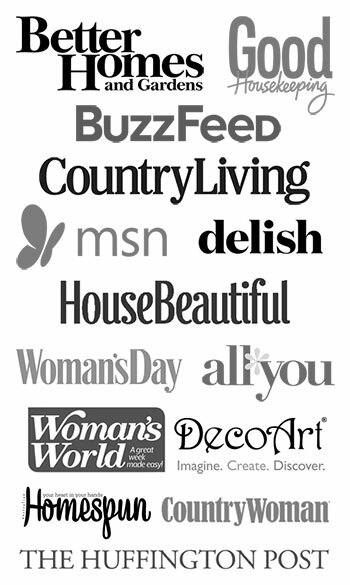 I am joining Susan at A Southern Daydreamer’s for Outdoor Wednesday. We’ve been eating local corn for the past month! It is so good freshly picked…to me the first two pickings were the sweetest. 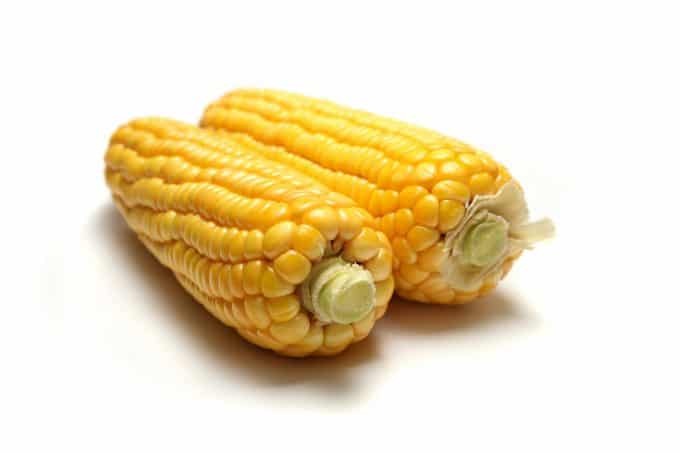 Lovely corn! We grew it once on our allotment but the squirrels (or rats, don’t like to think about that one) had the whole damn lot before we got to pick it! Boo hoo! Um um!! Love some good corn on the cob, dripping in butter. . .shame on me, I know! Enjoy your fresh corn it looks delicious. Pam, you are so funny. YOUR POINT PROVEN! Have a wonderful Wednesday! 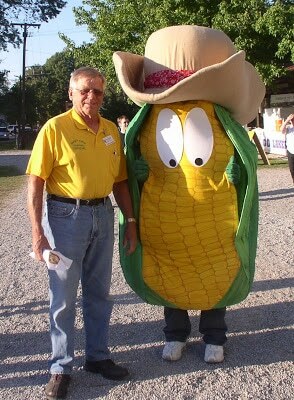 Hmmmmm you make me want to fix corn for dinner. We Hoosiers love our corn too – but not quite as much as you Buckeyes. 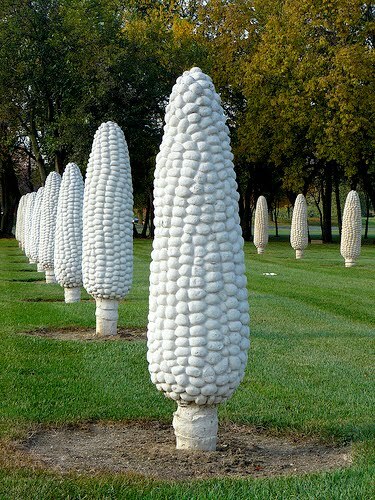 I don’t think we have any cement corn fields in Indiana. Wow, one of my life’s ambitions has always been to walk through a field of tall corn! Really – I’ve always wanted to do that. For a city girl, that seems like just the most amazing thing. 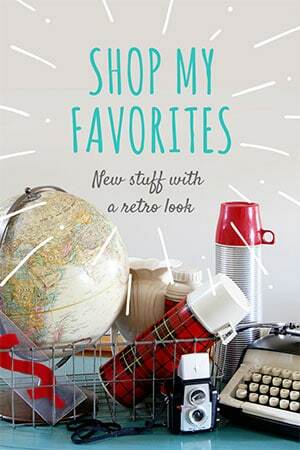 Didn’t know there were places that let you do it – I’ll have to check that out. I love corn. My mom used to make a supper of it! REALLY!! That concrete corn is one of the strangest art things I have seen! I love corn…and I learned an amazing trick from my kids. 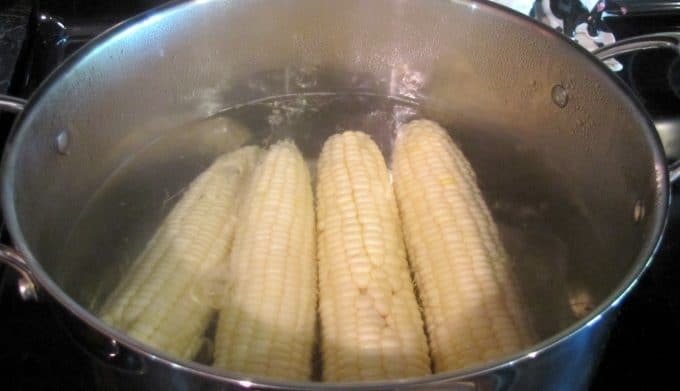 You wrap the pre-husked, clean corn in plastic wrap, put it in the microwave and zap it for a couple of minutes-It is the best corn I have ever eaten! Love the white corn in the field. I’d say that is pretty corny (sorry-couldn’t resist).